Commercial trucks are vital parts of the U.S. economy. They transport goods across thousands of miles each year, helping to keep our businesses running. Yet, a vehicle that spends the majority of its life in active use needs consistent and professional maintenance. Poorly maintained trucks are not only detrimental to a business’s daily operations, they could be potential hazards on the road. Federal legislation regulates the required upkeep of large commercial trucks. For example, drivers need to perform a pre-trip and post-trip inspection of their vehicles. Motor carriers need to ensure that all parts and accessories are in safe and proper condition at all times. Emergency doors must be inspected every 90 days. Every commercial vehicle must be examined a minimum of once a year by a trained inspector. Detailed records of truck inspections must be kept. Failure to adhere to these safety standards could result in penalties to the trucking company—and the possibility of a devastating accident. In an effort to meet tight deadlines and earn more income, trucking companies may overlook proper maintenance. An out-of-service vehicle costs the carrier money, so they have an incentive to keep as many trucks on the road as possible. Although immense pressure may be on the trucking company, they still have a duty to keep their fleet in safe, working order. Drivers who have been harmed in trucking accidents should look beyond the “common” causes: driver fatigue, distracted driving, and speeding. The truck should be inspected to establish whether it was in good, working order before the crash. All recent inspection and driving records must be examined for inconsistencies and missed inspections. Evidence that suggests the truck was not properly maintained could be substantial leverage in a personal injury claim. 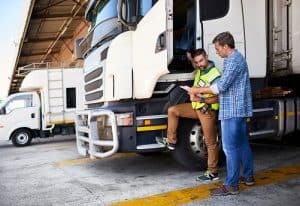 A highly qualified Georgia truck accident lawyer from Harris Lowry Manton LLP can build a solid case on your behalf against the at-fault trucking company. Our attorneys work with experts to extensively examine all facets of your claim, from driver error to negligent maintenance and more. To make an appointment in our Atlanta office, call 404-998-8847. To visit our Savannah location, call 912-417-3774. You can also reach us by completing our contact form.